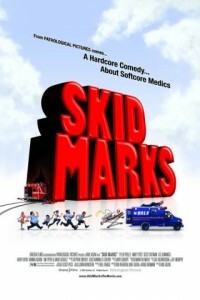 “Skid Marks” is not a story about your dirty underwear, rather, “Skid Marks” is an allegedly hilarious tale of two rival ambulance companies and their misfit medics; the Bayside Ambulatory Life Services ( B.A.L.S) team and the Downtown Intensive Care (D.I.C.) Unit. When budget cuts strike their quiet town of Bayside, it’s clear one ambulance unit must go. Now with their jobs on the line, these below-average EMT’s are about to prove they’ll stop at nothing to save their patients, their alter egos and their beer money. Hold on to you seat cushions and take your meds, as the heroes of “Skid Marks” penetrate a theater near you..